Hundreds of modifications were made to the Bullet over the years but, with the exception of the indicators, the Royal Enfield Classic (1998 - 2008) looked more or less the same as when it was introduced over sixty years ago. Although not significantly faster than the original 350 cc model, or different in appearance, the 500cc Bullet offered considerably more torque, noticeably swifter acceleration and more tractable power. Its higher gearing than the 350 helped the 500cc model achieve a higher cruising speed. 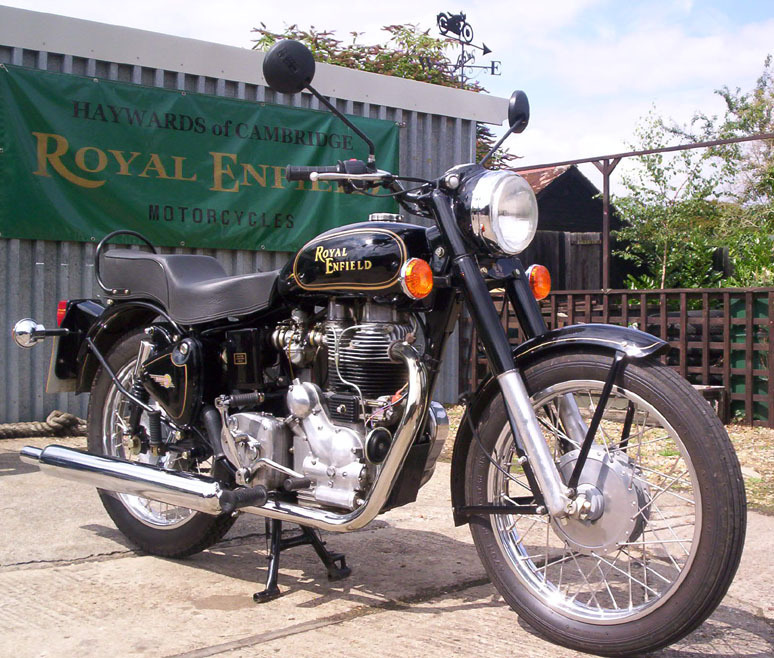 It took 52 years for the Royal Enfield Bullet to benefit from electric starting ! Although the basic design remained unchanged over 50 years, the addition of an electric start model (illustrated above) was only one of a number of refinements added over recent years, including up-rated 12 volt electrics, modern headlight, indicators and coil ignition plus alternator (replacing the magneto & dynamo). Electric starting was available only on 500 cc models.